With spectacular views of the Sea of Cortez, canyons and mountains, Club Campestre San José invites you to enjoy the incredible panoramic views, dramatic elevation changes, and undulating championship greens of a first-rate Mexico golf club. Created with masterful precision and challenging elegance, this unique Mexico golf course is nestled in the foothills of the Sierras and allows the golfer to enjoy breathtaking ocean views from every hole on the course. 2 and 3 Rounds Promo can be played at any Questro Courses including Cabo Real, Puerto Los Cabos* and Club Campestre. 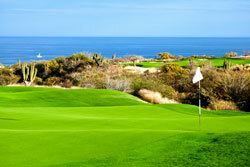 *For rounds played at Puerto Los Cabos there is an additional fee of $25 per round. All prices and times are subject to change without notice. For groups of 13 or more please contact us for rates and terms. Dress Code (players and riders): Appropriate golf attire is required. No swimwear, cut-offs, halter tops or tank tops, blue or denim jeans. Collared is required, pants or bermuda, soft spikes only (no metal) tennis shoes are allowed. Players may not bring their own food and/or beverage to the club house or golf course. If a player or group wants to introduce food or beverages, there will be a penalty of $50.00 per player. Food and beverages must be purchased at the course. Line Instruction available for $100/hour. Groups larger than 20 players require 2 instructors. Relax in your comfortable suite as you gaze at the lovely views of the Sea of Cortez at this all-inclusive resort.